Prune 30cm above ground level above a set of strong buds. 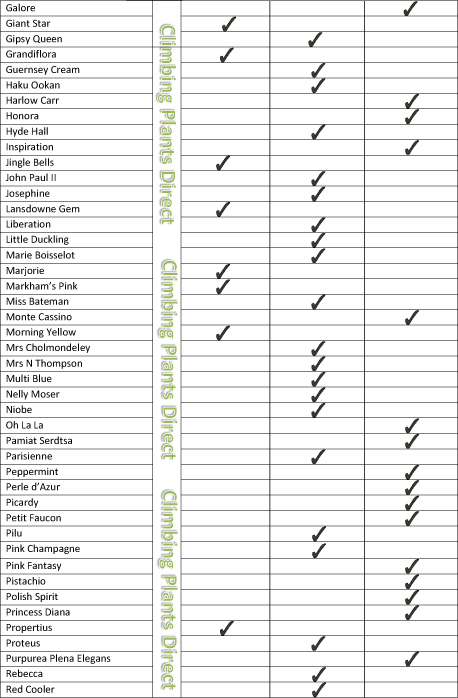 These are varieties, which flower on the previous seasons growth, they all flower early in the season. 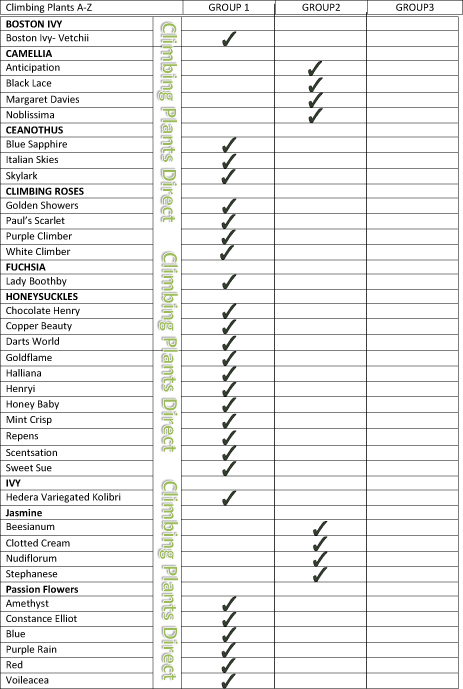 These include alpinas, macropetalas, the Evergreens and montanas. 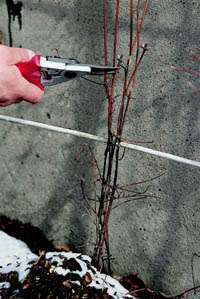 No hard pruning is required other than a good tidy up each year, removing any dead or weak stems after flowering in late May/June and tying the remainder to its support. Plants that have made excessive growth can be pruned back hard at this time if you wan't to reduce size. This will prevent the montanas from getting out of control and will stop others from getting a woody structure at the base. Pruning these plants at other times of the year will result in fewer flowers but will rarely damage the plant. 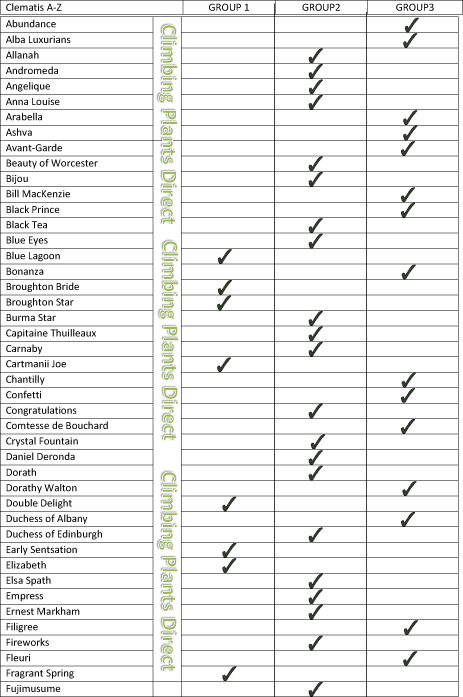 This group consists of all early, large flowered hybrids, including double and semi-double varieties. Their main flowering period is May, June and September. They should be left unpruned, but it is usual to remove dead or weak stems in February/March the remaining should be reduced to a strong pair of buds, a variation in the length of stems should result in flowers being more evenly spread along the length of the plant. Late large flowered hybrids, viticellas, texensis, herbaceous and species all fall into this group. These produce flowers on the current seasons growth and should be reduced to two strong buds in February/March, this will normally be 12-18" from the ground. 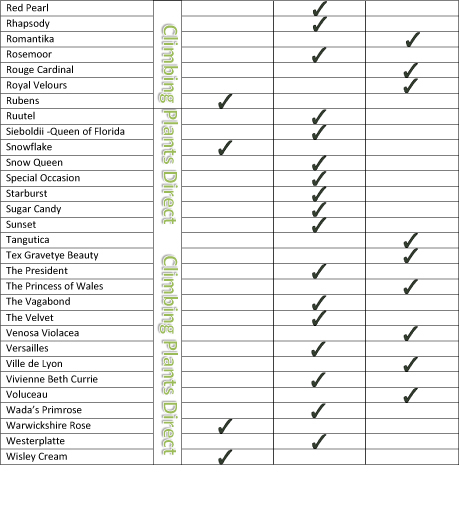 Failure to prune these varieties may result in the plant becoming bare of leaves and flowers at the base. 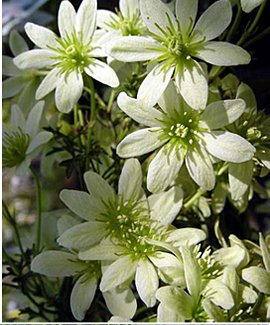 All clematis that you have planted new to your garden will need to be pruned down to 30cm (12") the first February/March after planting. 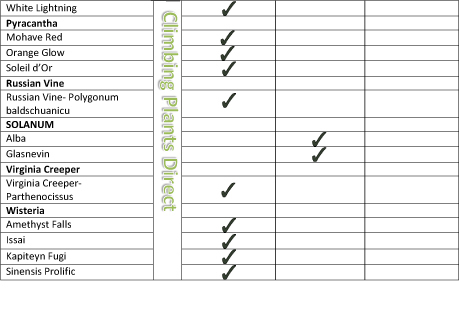 This will give you a strong healthy climber and encourage a bushy multi-stemmed plant . What if i have an older clematis in my garden that has not been pruned each year and needs a bit of help? You can rejuvenate an old, tired plant with a complete hard prune, carried out in two stages. First in late autumn, we would recommend partially pruning the clematis to waist height, tying in the remaining stems to avoid wind damage over the winter period. 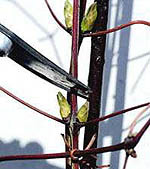 This partial pruning will encourage viable buds to form in the leaf joints low down on the stems which will then make the second stage, the final hard pruning (as above) in early spring more successful.